Buying local herb and vegetable starter plants from your local farmers provides the healthiest young seedling plants for your home garden. 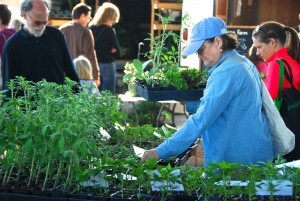 Local farmers grow all their plants from the best seeds they can find. They also know how to create the best conditions for starting plant growth. I’ve been purchasing vegetable starter plants for my garden from farmers for years now. One day after losing several vegetable plants after planting, I thought there had to be a better place to find healthier young seedlings. I remembered seeing young plants at a local farmers market, so I made the trip back to the market and found beautiful young herb and vegetable starter plants for sale. I then laughed to myself thinking “Well, of course, buying the same plants a farmer is using to grow their crops just might be the best choice”. Problem solved! 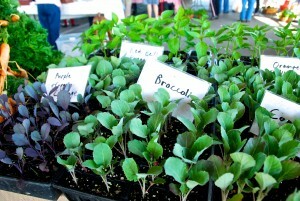 At the Franklin Farmers Market, most of our local farmers bring to market healthy young starter plants. You can find just about all the vegetable starter plants you need. You don’t have to worry about if any of the young seedling plants are labeled wrong. The root growth is strong and ready for planting in your home garden. If you need soil suggestions, you can ask any farmers for suggestions. Our local Williamson Farmers Co-op can help with any garden supplies you need. Our market soil expert Organics in Motion can also help advise you on best soil types. All our farmers are friendly and full of advice to help you with your home garden. You can find market starter plants from Kirkview Farm, Purple Tree Farm, Paradise Produce, Evans Produce and Earth Advocates Research Farm. We’ve created a starter plant photo gallery so you can see some of our vegetable and herb starter plants currently in the market. Good luck and happy planting! 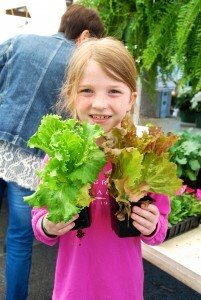 Hope to see you at our local Tennessee farmers market! This entry was posted in Market Saturday News on March 23, 2018 .